So, I've been a Mac user for about seven or so months now. And one thing I've been wondering is how to fully remove an application.. I know a lot of times applications leave extra junk on your computer; and, deleting the app from the applications directory doesn't fully remove it. I'm just wondering how I can 'search for and destroy' the files the apps leave behind. If the app is a driver or some kind of system hack, then you better read it's documentation or contact it's tech support team to find out how to uninstall it. For most apps, simply quit the app and drag it to the trash. Most mac apps won't create much extra "junk". It will leave a few configuration files/etc around, but they're usually really small and you want them to be there, incase you ever decide to install the app again. Open Finder, and bring up the Go menu. Hold down the Option key to make the Library menu item visible, and click on it. Type the name of the app into the top right search box (eg: "TextMate"), and when it suggests "Filename contains: textmate" in the menu, click on that. By default, it will search "This Mac", click on "Library" to only search the folder you were in before doing the search. Make sure everything you see is actually related to the app, and move it to the trash. When a file is selected, the "Path Bar" at the bottom of the window will tell you where the file is, which can help figure out what app it belongs to. Be careful, modifying anything in a Library folder can screw up your system. Don't do it at all unless you have a backup to restore to incase something goes wrong. It's usually pretty safe though, most files in the Library folder in your user's home folder will be re-created as necessary, if something important has been deleted. You might also want to search your entire system instead of just ~/Library, but if the app installs anything elsewhere in the system then that's a pretty good sign that you should be checking the documentation for the correct uninstall procedure and/or contacting their tech support, to make sure it is actually safe to delete those files without screwing up your system. If you are the type of person who regularly installs random apps from the internet and then deletes most of them... then you should either test these apps in a virtual machine or at least using the "Guest" account feature (where pretty much everything is deleted as soon as you log out). If you buy the app from the Mac App Store, you can completely uninstall it using Launchpad. Click and hold to start the apps wiggling, then hit the X by the app you want to delete. For apps installed outside of the Mac App Store, I use AppZapper. 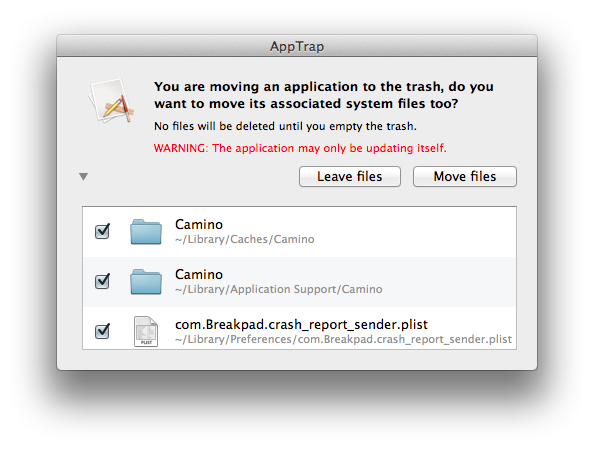 I use AppTrap. I it is free and installs a pref pane. Whenever you move an app to the trash, it asks you if you want to move all files associated with it to the trash. It works really well, and I highly recommend it. 01) You can manually un-install your application(s), but that requires solid knowledge of your file system for once and depending on the software it sometimes does not make much sense, since some software is deeply nested within your system. (also sometimes requires root access. 02) you can use software of course, that actually enables you to see where every single file related to your installed application is located on your system. That makes sense for beginners and even advanced users. some are available for trial, so you might want to test them, before you purchase!! Not the answer you're looking for? Browse other questions tagged software . How do I uninstall a program completely on a Mac? How can I block programs from opening? How to convert Aperture license to app store license? What app/feature/software is this microphone image from? Download app update once, install twice/thrice? What app could open text from anywhere in the editor of your choice? How do I install Jalmus? How to fully disable auto-fill-mode in Aquamacs 3.3?